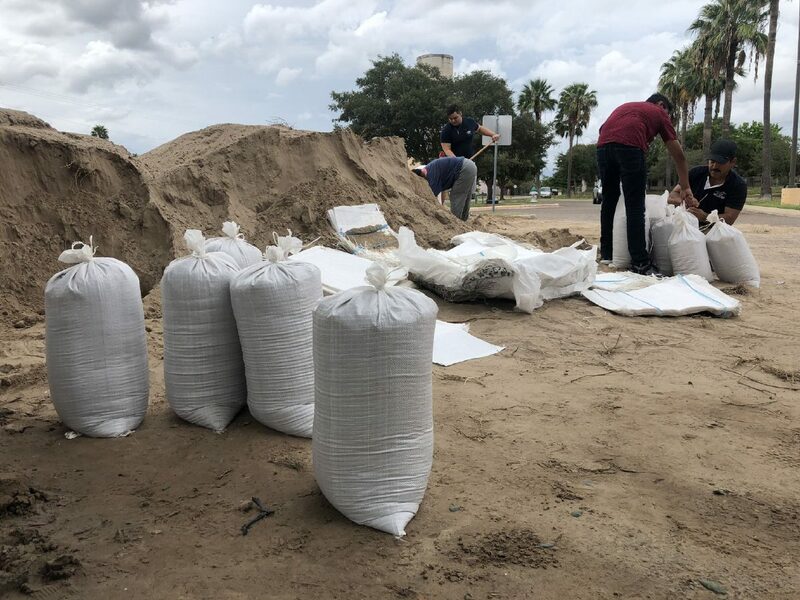 Weslaco residents fill up sandbags Monday outside of City Hall. WESLACO — The city and emergency manager met Monday to prepare for more rain as a tropical disturbance and Tropical Storm Isaac move toward the Gulf of Mexico. Meanwhile, residents here continue recovering from June’s flooding disaster. Alex Aguirre, 32, lined his mom’s home in the Northgate Woods subdivision with sandbags. The wooden structure and walls inside remain unrepaired after flood water damaged the home nearly three months ago. 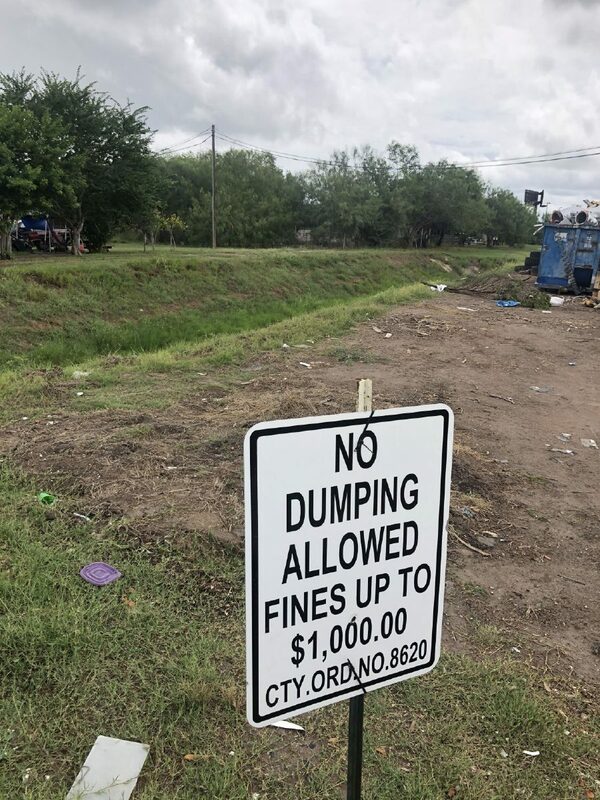 A sign warns residents of possible fines for dumping in drainage ditch north of West Interstate 2 on Paisano Lane in Weslaco. Neighbor Raul Mata Jr, 22, took time off from his job last month while workers installed new tile and replaced drenched and moldy sheetrock. Approximately 18 inches of rain fell near Weslaco, flooding about 25 percent of homes on June 20. “Me, personally, I just think that was just a bad day,” Mata said, suspecting climate change might have contributed to recent extreme weather. “My mom, she has sandbags ready to go,” he said. Other residents impacted by the flood, though, have called on city commissioners to allocate additional funding for more regional detention facilities as well as storm drain and drainage ditch maintenance. Commissioners have since approved an updated subdivision ordinance — requiring new developments install a detention area to hold a 50-year flood, a storm with a 2-percent chance of occurring in any given year. They are also reviewing locations for regional detention facilities, and will likely call for a bond election to be held in May. Though the City Commission has worked on the long-term solutions, they also directed City Manager Mike Perez to execute short-term drainage maintenance following the disaster deemed the “great June flood of 2018” by the National Weather Service. City crews positioned water pumps and continue cleaning storm drains in consideration of minor flooding possible this week in Hidalgo County. Scattered showers and thunderstorms could impact Weslaco Tuesday night, dropping up to a half an inch of rain, according to the National Weather Service. Rain is in the forecast throughout the week and into early next week. City leaders are also preparing in the event Tropical Storm Isaac, making its way across the Caribbean Sea, heads for South Texas. Forecasters predict Isaac will be located near Jamaica by Friday night. Forecasters anticipate the disturbance approaching the Gulf of Mexico will develop into a tropical depression Thursday night. Department heads will meet Wednesday morning and briefed on severe weather preparedness. Forecasters predicted about 4 inches of rain would fall in Weslaco on June 20, according to Emergency Manager Tony Lopez. Instead, parts of Weslaco saw up to 5 inches per hour that day. He encourages residents to be aware of the potential for severe weather, and take a “community” approach to alleviate flooding, including keeping debris off streets and grass clippings out of storm drains. >> City Hall at 255 S. Kansas Ave.
>> Harlon Block Park at 1020 W. 18th St. This story was updated Tuesday afternoon to include updated forecasts, including that Hurricane Isaac was downgraded to a tropical storm.